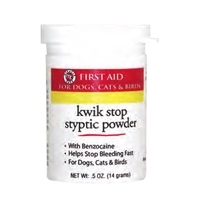 Gimborn Kwik Stop Styptic Powder 5 oz. Largest-selling styptic powder in the world. Quickly stops bleeding caused by clipping nails, docking tails, and minor cuts.